The 5th Posidonia Sea Tourism Forum will also address the bigger picture of the cruise industry, as this is likely to evolve given the current global developments. As a direct result of dramatic capacity increases, we will see new trends in deployment strategy and market development, along with fleet reshufflings and a spree in older generation vessel sales and renovations. The biennial Posidonia Sea Tourism Forum returns this May to Athens for its fifth consecutive edition at a new venue and celebrates the industry’s renewed optimism for East Med cruising. Following a sharp three-year slump due to geopolitical tensions, some of the region’s key destinations, homeports and host countries are experiencing the first promising signs of recovery. The region’s earlier than expected rebound was helped by Greece’s consistent performance as a destination of global appeal, keeping cruising in the area alive until Turkey started to be reinstated as a viable cruise destination. Equally important is a gradual re-inclusion of Israel and Egypt in niche itineraries that seek to reopen highly commercial cruise routes that deliver a fuller experience of the East Med’s unique diversity. With a global fleet expansion that will augment total berth capacity by 7.5%, 2019 is seen as the year that will bring new strategic developments that will also help re-establish the East Med as a major cruise development theatre. “We have a record year for newbuilding deliveries, as the 24 cruise vessels that come on line in 2019 constitute the largest number ever in a single year. 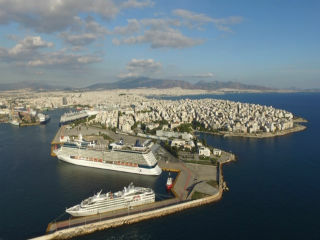 Collectively this will add a total of 42,488 new berths to the global capacity that need to be filled gainfully,” said Theodore Vokos, Managing Director of Posidonia Exhibitions S.A, organisers of the Posidonia Sea Tourism Forum. The event will be held from May 28-29 at Domotel Kastri Conference Center, in Athens’ historic northern suburb. CLIA Europe has already confirmed its active participation at the Posidonia Sea Tourism Forum and is expected to participate with a high-level delegation. This can be seen as a firm statement on East Med’s commercial potential and its future role in the sustainability of cruising in the Mediterranean as a whole. According to Tom Boardley, CLIA Europe Secretary General: “CLIA has increased its presence in Greece and the Eastern Mediterranean region and we hope to build on this with closer and stronger ties with local stakeholders to highlight the importance of the region. This year’s Posidonia Sea Tourism Forum will offer us a unique experience to work with policymakers, regulators, other industry stakeholders and local communities’ representatives towards the achievement of this goal. The Forum will tackle these issues as key factors affecting the cruise industry’s global development and examine the economic opportunities they create for a wide range of sectors. Also to be discussed are technical innovation trends, environmental and alternative fuel challenges, pressing infrastructure development needs and much more. Ultimately, the 5th Posidonia Sea Tourism Forum aims to present a multifaceted view of contemporary cruise development and the importance of finding new ways and synergies to improve the commercial and economic relationship between cruise industry, stakeholders and destinations. “The conditions are right and the Posidonia Sea Tourism Forum is ready to once again set the tone and empower the discussion for the future of the cruise industry in the East Med during an action-packed, two-day event. It will be attended by the sector’s most prestigious and powerful cruise brands and decision-makers from around the world,” said Vokos. The 5th Posidonia Sea Tourism Forum is organised under the auspices of the Ministry of Tourism and the Ministry of Maritime Affairs & Insular Policy and is supported by the Hellenic Chamber of Shipping, the Association of Mediterranean Cruise Ports (MEDCRUISE), the Hellenic Professional Yacht Owners Association, the Greek Marinas Association, the Association of Passenger Shipping Companies, the Union of Cruise Ship Owners & Associated Members, the Federation of Hellenic Associations of Tourist and Travel Agencies (fedHATTA). Silver sponsors are the Piraeus Port Authority and HEMEXPO and Bronze Sponsors are Air France - KLM - Delta, Aktina Travel Group, Global Ports Holding and Celestyal Cruises.